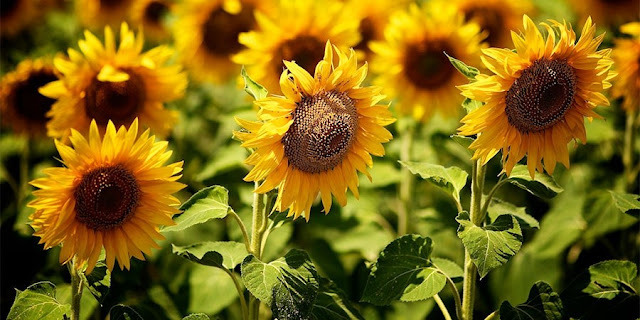 When the weather it’s hot, it’s their time in the fields – the sunflowers, which live up to its name and not only are always looking for the golden globe (a phenomenon called heliotropism) but also their shape and color are similar to it! Its scientific name Helianthus annuus (which derives from the Greek “helios” which means sun and “anthos” which means flower), belongs to the family Asteraceae and has its origins in Peru. In the world it is also known as: Girassol (Spain), Tournesol (France), Girasole (Italy), Sunflower (UK and others), Sonnenblume (Germany), among other designations. These annual plants, very rustic, can reach 2 to 3 m high or 40 cm, if it is dwarf variety. The inflorescences of capitula type, can reach a diameter of 30 cm and are very attractive to both birds (due to the brown color of the seeds) and pollinating insects. In the popular belief the “flower” of sunflower means happiness and the yellow color symbolizes warmth, loyalty, enthusiasm and vitality, reflecting the positive energy of the sun. In the Christian symbolism, it evokes the divine light. And the Roman emperors, the kings of Europe and Asia crowned their heads with sunflowers. In China, it is the symbol of immortality. For these reasons it is widely used in Feng Shui decoration. But nowadays its cultivation is increasingly expanding and it isn`t no longer limited to the ornamental use, as being an oleaginous plant, its seeds can be used for different purposes: production of cooking oil, biodiesel, lubricants, soaps and even to human consumption as a snack (“pipas”). Additionally, the fibers that exist in the long stem can also be used for papermaking. From a nutritional perspective, the sunflower seeds contain about 587 kcal/100g being a good source of mono and polyunsaturated fats, fibers, proteins, vitamins (like E and B1) and minerals in appreciable quantities (eg. manganese, copper, magnesium and selenium). Although the sunflower seeds provide high amounts of energy, 30 g are enough to have a noticeable effect on satiety reduction and in nutrient supply. – it should be watered regularly to prevent growth deficiencies. Although it is a rustic plant, and hence more resistant, it is susceptible to alternaria and attacked by cutworms (Agrotis epsilon), Sunflower Patch (Chlosyne lacinia saundersii) and even ants, among other species. It is advisable for good crop practices to avoid the appearance of either diseases or pests, but if you have some doubts use the OpenPD app and send your publication to the forum where a community (including technicians, farmers and scholars) is waiting for you to clarify you. It is simple and free. Download the app now in https://goo.gl/PyHmgO.